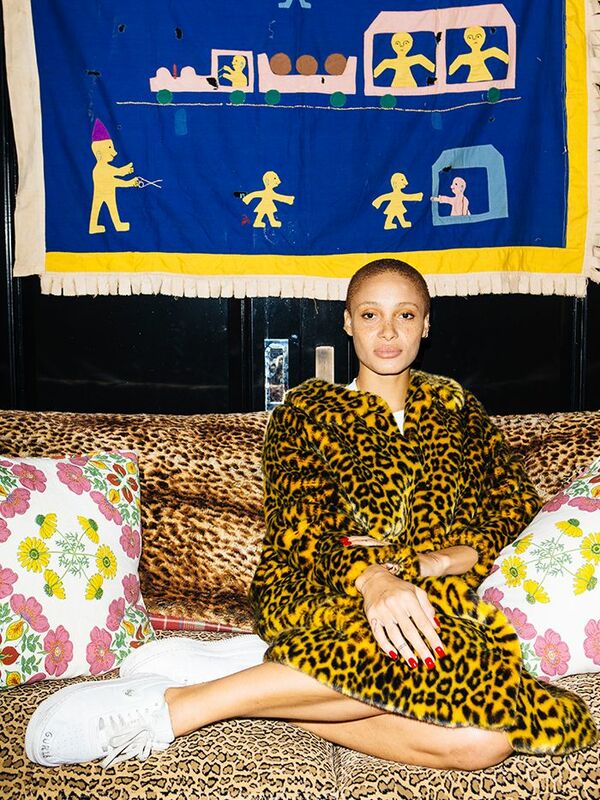 When the Who What Wear UK team had the privilege of stepping into Adwoa Aboah’s closet for our Best Wardrobes in Britain franchise, we knew we had to glean as much vital fashion intel as was humanly possible within half a day. Adwoa is the face, voice and vibe of our generation. She is no ordinary supermodel, yet there’s something delightfully ordinary in just how down-to-earth she is for someone with a face so divine and a bookings list that reads like a what’s what and who’s who in the industry (think Vogue covers, major ad campaigns with Ugg or Burberry, British Fashion Awards flying in left and right). As such we wanted to grill Adwoa on a few more important things outside of her personal style and eclectic wardrobe. So here’s the first in our miniseries of Aboah’s solid advice: festival dressing like a grown-up. Adwoa’s festival essentials don’t include such arbitrary things as a pac-a-mac or wellies: “A hat. A bumbag or rucksack. Some sort of mad coat. And, I think something like a bikini top if it’s hot weather,” she tells us. As for being able to look like yourself at any given festival, in Adwoa’s opinion the obvious clichés should stay at home—unless they are truly linked to your personal style. “Like denim shorts and flowery headbands. [It’s about] just not following a trend. You don’t need to start dressing like you’re part of a tribe. I just think it’s a bit odd. Just go with whatever you want, or dress casually. Everyone always has a bit more fun when they’re at a festival but … I’m really not into the flowery headband thing.” Her best advice? Maybe don’t care about what you wear at all—at Glastonbury (Adwoa’s favourite festival) or Coachella she admits that doesn’t mind what she’s seen in, but Burning Man is the perfect opportunity to let your fashion choices run wild, as it’s all about dressing up. Key takeaways: Swap hats for floral head garlands. Try not to give a crap. Oh, and take her up on the bumbag advice—being hands-free at a festival is a complete godsend. No doubt about it—baggy jeans are coming back. These are the slides of summer 2018. This will start conversations for you. Practicality is, at times, overrated. Like an umbrella but without the hassle. The new sunglasses collaboration to know now. To be worn as a top, of course. Glasto can get very cold. Mix this fun fringed top with the colourful Agua de Coco Bikini Briefs (£132). If you’re heading off to hotter climes, be sure to check out our holiday packing list too.